Released in 1984, Amadeus is the story of the last 10 years of Amadeus Wolfgang Mozart told in flashback through the eyes of Italian composer Antonio Salieri. Eaten up by envy at Mozart’s talent, Salieri plots to kill the great composer so he can pass off Mozart's Requiem, which Salieri commissioned him to write during a masked ball, as his own. Salieri's rage boils over after Mozart transforms a piece written by the Italian’s composer into the "Non più andrai" march from his 1786 opera The Marriage of Figaro. Mozart had arranged the piece from memory after hearing the original only once convincing Salieri of the Austrian’s genius – and hating him even more for it. But Mozart’s health starts to deteriorate and he dies before finishing his famous Requiem. His unfinished score is locked away by his wife Constanze, out of the reach to Salieri. 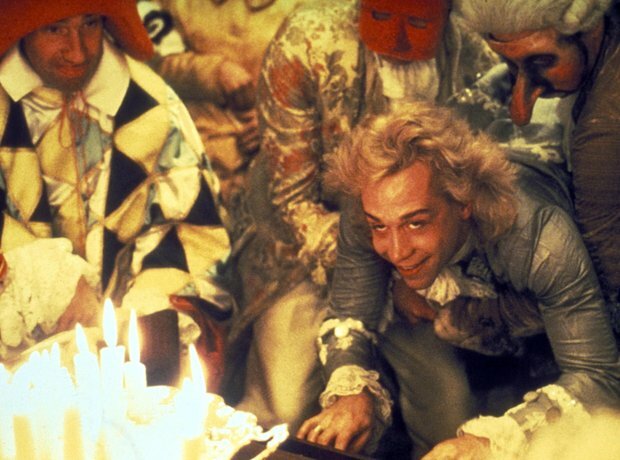 Amadeus was a commercial and critical hit and was nominated for a total of 53 awards, eventually scooping 40, including eight Oscars (including Best Picture), four BAFTA Awards and four Golden Globes. Kenneth Branagh was in the shortlist for the title role, which eventually went to Tom Hulce, who has gone on to be a Broadway and film producer. Amadeus was directed by Miloš Forman and written by Peter Shaffer, adapted from his 1979 stage play of the same name. F. Murray Abraham played Antonio Salieri while Mozart’s wife, Constanze was played by Elizabeth Berridge. The soundtrack featured many of Mozart’s greatest works. Most of the tracks were performed by the Academy of St. Martin in the Fields, conducted by Sir Neville Marriner. Marriner agreed to score the film only if Mozart's music was left completely unchanged. The soundtrack, including Ecco la Marcia from The Marriage of Figaro, and, of course, Requiem, reached number 58 on the US Billboard charts, making in one of the most successful classical music recordings of all time.